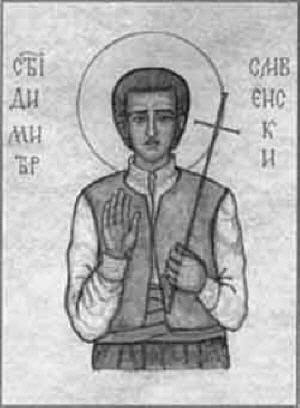 The Holy New Martyr Demetrius (Dimiter) was born on October 9, 1818 in Sliven, Bulgaria. His parents had no children for the first eight years of their marriage. Their prayers to God were answered, and their sons Stephen and Demetrius were born. Demetrius was the younger son, and was brought up in a pious manner. He did not go to school, but he attended church frequently and memorized many prayers and services. After their parents died, Stephen left home and went to Wallachia. Demetrius remained in the family home, which soon collapsed because of its age. The Muslims used this excuse to seize the surrounding property, and Demetrius became a servant to one of them. The family tried to convert him to their religion, but Demetrius resisted such attempts. "Our Orthodox Christian religion was given to us by the Lord Jesus Christ," he said, "while yours was given to you by Muhammad, a mere man." They threw Demetrius out of the house when they heard this, and he later became a baker. Even while selling his bread in the marketplace, Demetrius proclaimed the Orthodox Faith and pointed out the deficiencies of Islam. Naturally, this outraged the Muslims, and they began to plan their revenge. A new kadi came to Sliven, and Demetrius was chosen to prepare the food. The local beys chose him because they knew he had insulted Islam. The kadi offered him tobacco and liquor, but Demetrius said that he did not smoke or drink. When he tried to leave, the kadi said, "Let me make you a Muslim. You see what a good life we have. If you convert, I will tell your master to give you his daughter in marriage, and half of his riches." Demetrius answered sarcastically, "Oh, sure." Mistaking this for a serious reply, one of the Muslims began wrapping cloth around the young man's head in the form of a turban. Demetrius threw the turban to the ground and ran from the house. Some of the Hagarenes chased him, but were unable to catch him. For three days he hid in the village of Ichera without food or water. Demetrius went to a bishop and told him his story. The bishop encouraged him to remain Orthodox, then sent him away with a gold coin and a wooden cross. Exchanging the coin for change, Demetrius gave half the money to the poor. Then he went up to a Muslim guard and said that he was the one they were seeking. He was escorted back to Sliven with his hands tied behind him. When he met an Orthodox Christian Demetrius said, "Forgive me, brethren. I gave myself up to these ungodly people for the glory of our Faith." When St Demetrius was thrown into prison, he asked for the priest Stephen to visit him. His request was refused, but Fr Stephen learned that Demetrius was incarcerated and tried to have him freed. The kadi ordered Demetrius to be brought to him while he was dining with other officials. The kadi asked Demetrius if he was willing to accept Islam. Christ's holy martyr informed him that he had never promised to become a Muslim, and he had no intention of doing so. "If you took my irony for truth, I am sorry for you." He went on to call Muhammad a false prophet, and his followers sons of Satan. The kadi told Demetrius that if he did not become a Muslim, he would be put to death. Then he sent him back to prison for three days to consider this. When he was brought before the kadi again, Demetrius refused to convert. Then he was ordered to be executed. When the other Christians heard of Demetrius's fearless confession of faith and his impending death, they brought Father Stephen to him. Demetrius told the priest he was afraid that he would not be able to endure the tortures. Fr Stephen urged him to remain strong and bear witness to Christ. St Demetrius remained in prison for a whole year. His tortures continued, and no one was able to help him. At the beginning of the year, many Muslims gathered and shouted for the kadi to execute Demetrius. Therefore, he summoned Demetrius before him. The fearless martyr remained unshaken in his resolve, and mocked their faith. For the last time Demetrius was offered the choice of converting to Islam or being put to death. He said he would remain a Christian whatever they did to him. Father Stephen came to the prison to hear the saint's confession and give him Communion. On the morning of January 30, 1841 Demetrius was brought to the place of execution. He asked forgiveness of the Christians he met, entreating them to pray for him. Then they ordered him to kneel on the ground for beheading. The first stroke did not sever his head, and he remained motionless. With the second stroke, the martyr's head fell to the ground. The Christians soaked cloths in his blood, and Fr Stephen collected some of the blood-soaked earth in a box. The holy relics remained unburied all night. The kadi ordered the body to be thrown into the river the next day, because Muslims believe that the bodies of those who insult Muhammad should not be received by the earth. After a sufficient bribe had been paid, the kadi released the body for burial in the garden of the monastery. St Demetrius now lives in the heavenly Kingdom, glorifying most holy Trinity, the Father, the Son, and the Holy Spirit throughout all ages.